I read this in 69 daily installments care of dailylit.com – a wonderful idea of a website. 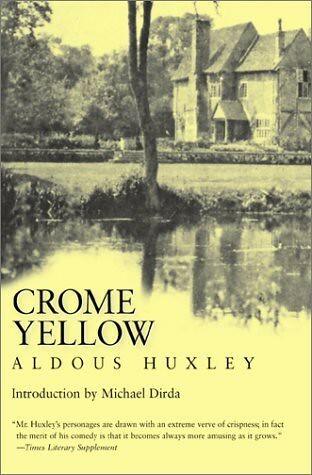 Huxley had a masterful vocabulary and he uses it to full effect to construct Crome and its array of eccentric characters. The interaction between them is also cleverly crafted and throughout there’s a great sense of irony. The novel was a joy to read from start to finish. Along this particular stretch of line no express had ever passed. He took no one by surprise: there was no one to take. A flush of pleasure turned Mary’s face into a harvest moon. One comes to the great masterpieces of the past, expecting some miraculous illumination, and one finds, on opening them, only darkness and dust and a faint smell of decay. chiaroscuro: Italian for “light-dark.” The gradations of light and dark values in two-dimensional imagery; especially the illusion of rounded, three-dimensional form created through gradations of light and shade rather than line. Highly developed by Renaissance painters. peripatetic: In the Greek, the word “peripatetic” means “walking with.” This was the method of teaching that Aristotle used – ie, “walking with” his students in the gardens as he taught them and they questioned him. Hence, the term “peripatetic” is used to describe the followers of Aristotle. muniment: Documentary evidence by which one can defend a title to property or a claim to rights. plenum: empty chamber in the path of airflow allowing smooth air transition. He climbed into the hearse.